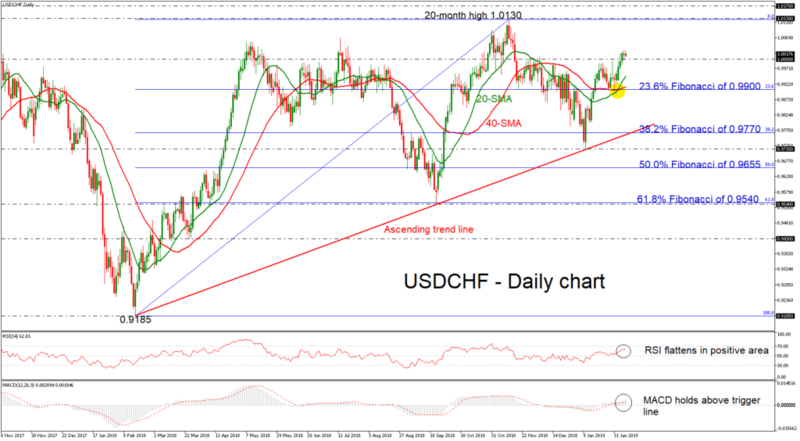 USD/CHF surpasses 1.0000 critical level; remains above SMAs bullish cross. 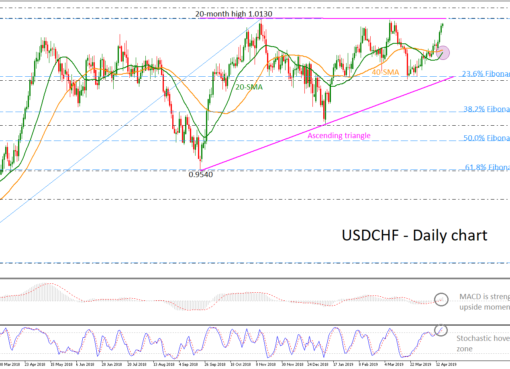 USD/CHF has moved considerably higher after the bounce off the 0.9715 support zone, which overlaps with the ascending trend line. 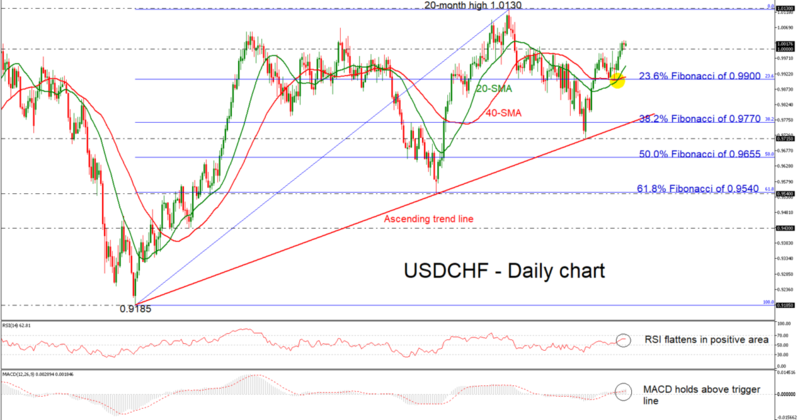 The price returned back above the 1.0000 strong psychological level and seems promising for further bullish structure. Having a look at the momentum indicators, the RSI lies in the positive territory but is flattening, while the MACD oscillator climbed above the trigger line, indicating upside tendency. 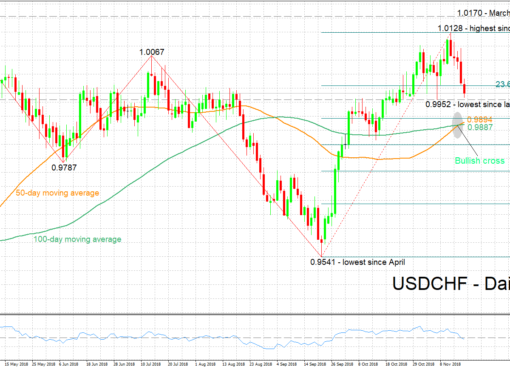 Moreover, the 20- and 40-simple moving averages (SMA) recorded a bullish cross in the previous sessions around the 23.6% Fibonacci of the up leg from 0.9185 to 1.0130, near 0.9900. 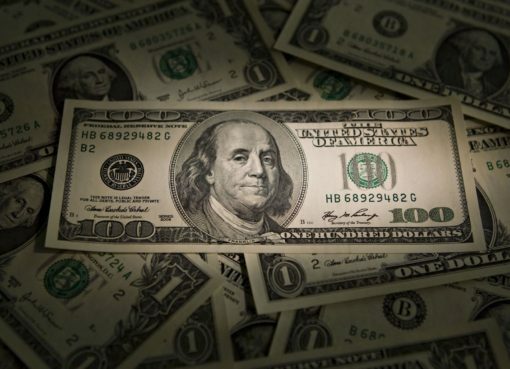 Should the pair continue to head higher the next level to have in mind is the 20-month high of 1.0130, where it topped on November 13. A break above this level would open the door for a higher high in the daily chart near the 1.0170 resistance level, registered on March 2017. On the flip side, if the price tumbles below the 1.0000 level, it could find support on the 20-day SMA currently at 0.9950. More losses could send the bears until the 23.6% Fibonacci of 0.9900 before edging sharply lower towards the 38.2% Fibonacci mark of 0.9770.